Allergies can give you a fuzzy-headed feeling that makes it difficult to concentrate. Find out what’s causing your brain fog and how to fight it. When you’re rubbing itchy eyes and sneezing your way through an allergy flare-up, do you also feel muddled and fuzzy-headed sometimes? Many allergy sufferers describe an experience known as “brain fog” — a hazy, tired feeling that makes it difficult to concentrate. What is this phenomenon and why does it happen? 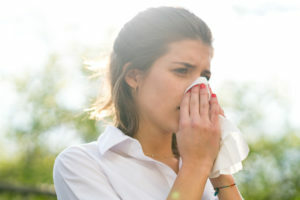 According to allergist and immunologist Mark Aronica, MD, that disconnected feeling is fatigue, and it’s caused by the inflammation that results when your body tries to counteract your allergy symptoms. And, once the cycle starts, it’s sometimes self-perpetuating. You can find it difficult to go about your daily routines. The more fatigued you are, the more difficulty you’ll have performing well in school or work. It can also negatively impact your quality of life if you’re too tired to do things you would normally do. Cytokines are are proteins that are part of your body’s immune response to foreign substances. You also produce them when fighting infections caused by bacteria, viruses and colds. The cytokine release causes inflammation in your nose, leading to congestion and narrowed airways. If you have allergies, allergen exposure leads to ongoing inflammation. And nasal congestion and disturbed sleep combine to give you that fuzzy-headed feeling. If your allergies are acting up and you feel the fog rolling in, there are a few things you can do to help stop the debilitating cycle of symptoms, inflammation and fatigue, Dr. Aronica says. 1. Limit your exposure. 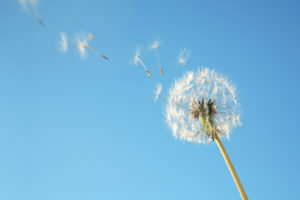 If you’re allergic to pollen or grasses, do your best to stay away from them. Stay indoors when they’re at their peak. Keep your windows closed if you have air conditioning. If you do spend time outside for longer periods, take a shower and change your clothes right away when you come in. If you’re allergic to dust or mold, keep up with dusting and cleaning to keep them out of your home as much as possible. 2. Take your medicine. Medication can help curb your allergy symptoms. Oral antihistamines (medications that prevent you from responding to the histamines that cause inflammation) are readily available. They’re a temporary solution, but they are often effective. Over-the-counter and prescription nasal sprays can also help combat your allergy symptoms, Dr. Aronica says. 3. Get allergy shots. This is the strongest form of treatment for allergy symptoms. Small injections of allergens under the skin can help your body build up an immunity over time. The result is less frequent and less severe allergic rhinitis, Dr. Aronica says. He adds that some allergy sufferers also find relief with nasal lavage — a saline wash that cleans out the sinuses and nasal passages. Many people administer this type of wash with a neti pot to clear out lingering allergy symptoms. Dr. Aronica notes that other conditions besides allergies may cause fatigue and brain fog. If you have a sore throat, cough, fever or body aches, you could have a cold or other illness and should take medications that will combat those symptoms.